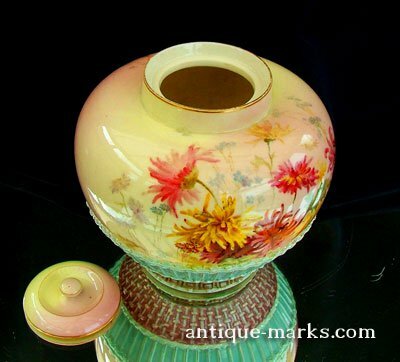 From the antique-marks collection we have a rare and beautiful Royal Worcester Prismatic Enamels Vase of bulbous ovoid form. Complete with original cover and dating to circa 1888. 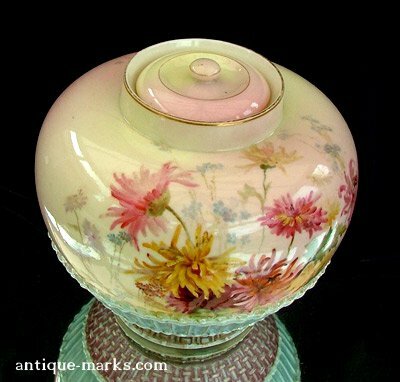 The Royal Worcester vase superbly decorated with handpainted floral sprays to the front and reverse faces. 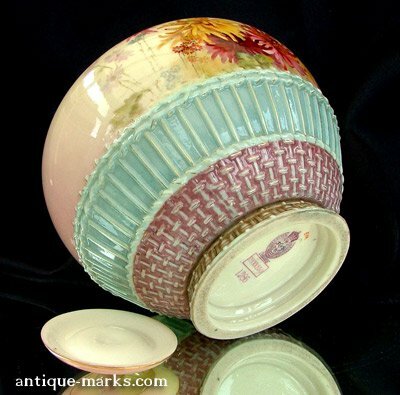 The decoration set against a graduated pink and yellow ground and rising above an intricately layered basket weave base. The whole resting on a single raised foot. 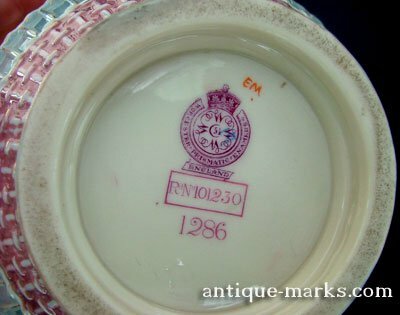 Fortunately this Royal Worcester vase is in excellent condition and bears the Royal Worcester puce printed crown and wheel mark, dating c1888 and shape number “1286”. The vase bears the Royal Worcester puce crown mark surrounded by the Prismatic Enamels logo. The vase is shape number 1286. 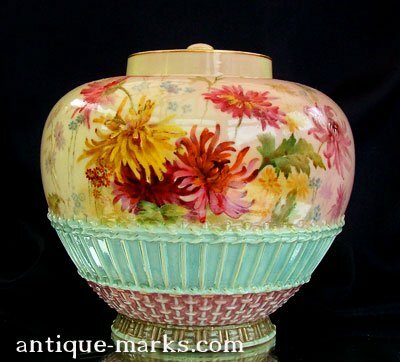 The covered Worcester vase Stands: 12.5cm tall on a 7.5cm foot rim and has a 6.5cm rim & 12.5cm wide body. 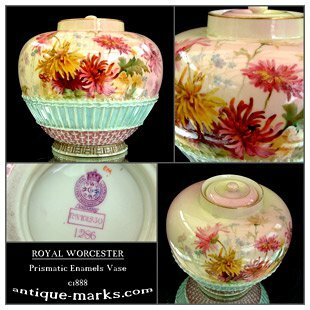 In 2006, Christies sold a pair of Royal Worcester Prismatic Enamel Ewers dating to circa 1891 with printed Worcester Puce Marks in shape number 1581 for £1320. Sotheby’s Australia sold a 39cm tall prismatic enamel footed vase, decorated by Edward Raby and dating to c1895, for $5000 AUD.